A $3.4 billion Chinese-built railway linking the Ethiopian capital Addis Ababa and the port city of Djibouti opened Wednesday, a boost to both African countries’ economies and an important milestone for Chinese investments in Africa. The new 750-km line, which completely replaces a long-defunct French line built in the early 20th century, will reduce travel time between the two cities to 10 hours from the two to three days it currently takes to navigate the congested potholed roads crossed by 1,500 trucks a day. The trains, which will transport freight only during an initial three-month testing period, will be manned by Chinese drivers and conductors for five years while local staff are trained to operate the line. The new line will give Djibouti unprecedented access to Ethiopia’s market of 95 million people. For Ethiopia, the project is a key part of the government’s strategy to industrialise the country by luring foreign investment. Ethiopia has a long way to go, however. The International Monetary Fund estimates that growth, at a massive 10.2 percent in 2015, will plunge to 4.2% this year amid the worst drought in 30 years. And according to a 2015 World Bank report, 80 percent of jobs in the Horn of Africa country are still in agriculture, while unemployment is at 17 percent nationally and at 24 percent in Addis Ababa. Chinese investors, however, are optimistic. According to the China Global Investment tracker, China has poured more than $20.6 billion into Ethiopia since 2005, most of it focused on infrastructure projects such as roads, rail lines and telecommunication. Chinese engineers and foremen on infrastructure building sites are a common sight across the country. “It is the first standard gauge electrified railroad on the continent built with Chinese standard and technology, and certainly it will not be the last. Many stand to benefit from it,” the Chinese ambassador to Ethiopia, La Yifan, said in a statement. Chinese investment is not limited to Ethiopia. African natural resources have helped fuel China’s economic boom, and it became the continent’s largest trade partner in 2009. In 2012 China built the $200 million African Union headquarters in Addis Ababa as a gift expressing “friendship to the African people”, and Beijing hopes to play a central role in the African Union’s ambition to link the continent by rail. “China is filling a desperately needed void to help finance some of the trillion dollars that Africa needs to build its infrastructure,” Eric Olander, editor of the China Africa Project blog, told FRANCE 24. 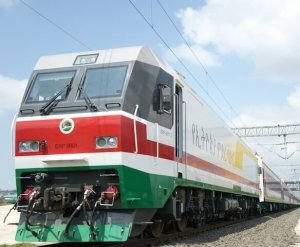 The new line is the first step in a vast network of 5,000 kilometres of rail that Ethiopia wants to build by 2020, and it hopes it will be the starting point for an African Union plan to link the continent by rail from east to west. But this ambitious project presents its own challenges. As planned, the railway would have to pass through war-torn countries such as the Central African Republic and South Sudan. China is also making efforts on the security front, however, contributing more than 3,000 “Blue helmet” UN peacekeepers to missions on the continent in conflict zones such as South Sudan. “China has also been an active participant in multinational anti-piracy operations off the coast of Somalia to facilitate the transit of international shipping that was paralysed a decade ago,” said Olander. “So in that sense, China is making real, meaningful contributions to African peace and stability.